I don't have a neat trick or a well drawn out play for Silvershard Mines. But I thought I'd bring it up anyhow, because who doesn't want to talk about Saved by the Bell? And because the more randoms I do, the more I notice people haven't thought through this BG. This map is controlled by hanging out in the hallways, and playing with switches. As you see in the picture, there are three small corridors that can control all of the depots. If your team can control 2 of them, you've won this BG. You may be tempted to leave your teammates behind and run up to the center to get control of a cart, but remember the cart going into a Depot is worth waaaaaay more resources than controlling the cart at any given time. Once you graduate from randoms to RBGs, you'll come up against some much more thought out strategies; the "three-corners" is a popular one (google it). Regardless of the strat you're coming up against, if you control the corridors, and control the switches, you've got it made. 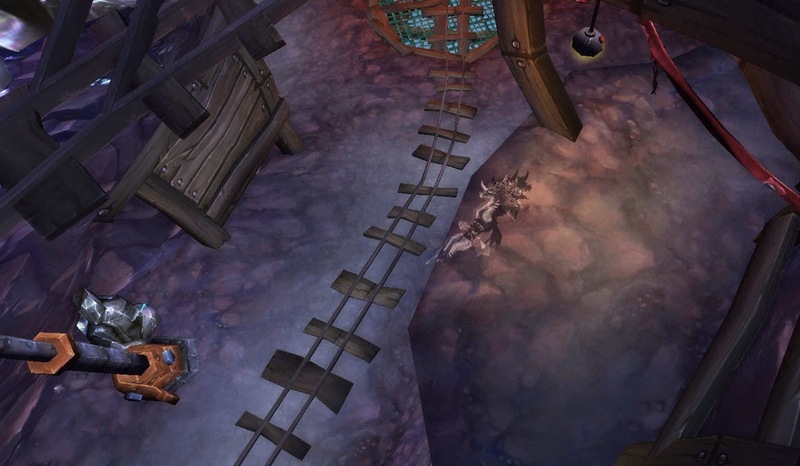 As a hunter, one of my favorite things to do is leave one of your teammates on the tracks as bait (Mack, a DK on our team, is my favorite bait; people love picking on DKs), and hang out on one of the overhead paths in your predator costume. You can play hawkeye up here pretty well, picking off your opponents 1 at a time, or if a cart comes that you don't control, you can quickly jump down to help "cap" it. There are a couple things to remember, the most important being what I just said, jump down immediately if there's any chance your team won't control the cart. Nothing makes BG leaders more angry in this fight than people not fighting on the cart. The second thing is keep an eye on your map so you know if someone is coming up behind you. The third, which warrants its own paragraph, is for goodness sake, do not use the berserking buff when there is no one around you to fight. Both of these overhead paths have a berserking buff on them; go ahead and stand fairly close to them so you can grab it as soon as an opponent comes into range, but do not use it when you're all alone. Maybe one day I'll do an entire post on using the berserking buff..
Who knew that Whoomp There It Is was actually an RBG instruction guide; "tag team, back again, check it to wreck it, let's begin". 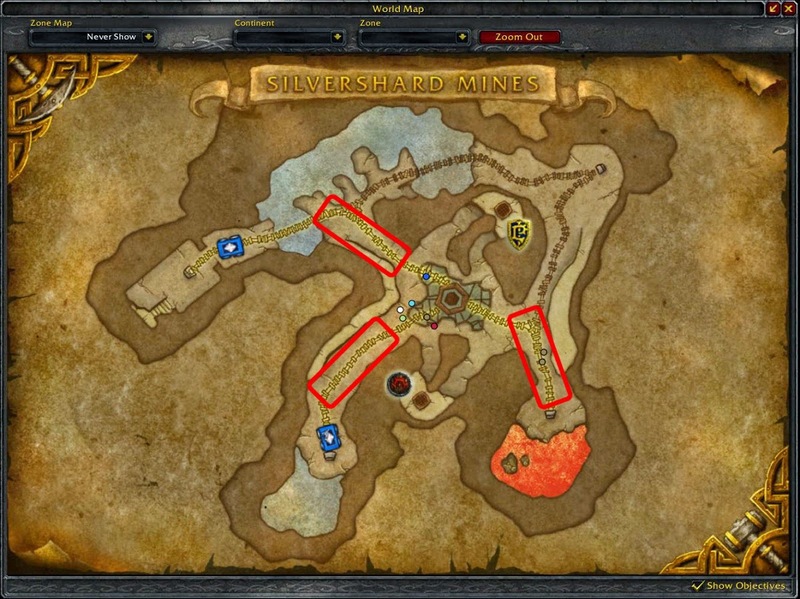 The last thing I want to talk about in Silvershard Mines, is something everyone who does arenas always has planned out, but too often goes unassigned in RBGs: CC tag teaming. Any guide you ever see on Silvershard Mines will tell you the same thing, this is a CC game, not a kills game. That's because unless you're at a place where you're outnumbering your opponents fighting for the same cart, the time it takes to kill someone is going to be way more than the time it takes to CC someone outside of the cart's range. The secret here is to get someone who has some good knock back coupled with someone who can root, stun, trap or even snare/slow. Pair a druid friend with a Mage, practice getting them to Typhoon someone into ring of frost; or better yet typhoon two people into ring of frost. Or take your favorite DK and practice having them Death Grip someone into your freezing trap. And that's that. Remember, check it to wreck it, and pretend like you're on Saved by the Bell!